This piece speaks to my experience as a neurodivergent father with neurodivergent kids. “Special” is non-inclusive, discriminatory language. It is a deficit and medical model euphemism that excuses segregation and exclusion. “Special” is the language of patients captive to a disability industrial complex. “We have a medical community that’s found a sickness for every single human difference. DSM keeps growing every single year with new ways to be defective, with new ways to be lessened.” “We have created a system that has you submit yourself, or your child, to patient-hood to access the right to learn differently. The right to learn differently should be a universal human right that’s not mediated by a diagnosis.” Identity-first is the language of agents. By replacing “special” with social model language, we can begin the transformation from patient to agent. “Special” is the language of abuse. People that are “special” can be tormented and murdered. Change our vocabulary and change our framing. Use the inclusive language of neurodiversity & the social model of disability. Use the power of identity first language to connect disabled kids with an identity and tribe. With identity-first pride and a social model tribe at their backs, kids can better develop voice, agency, and the tools of self-advocacy. The time is now for social model inclusion. Our needs are human needs, not special needs. Language matters. We have a moral imperative to connect with the communities we serve and use the language they prefer. It is also to acknowledge and discuss the fact that the disability rights movement has been having conversations about language and disability terminology for decades, and that many nondisabled people are (perhaps willfully) unaware of these conversations. They come up with complex and tormented euphemisms to talk about disability instead of just asking a disabled person if there’s an appropriate term. Many nondisabled people are shocked that many people with disabilities, including myself, view ‘special’ as a rank insult that is horrifying to encounter. This word makes me so angry. So angry. Thus, when I say ”special’ troubles me,’ I mean ‘please do not use this term to refer to me, because I find it personally insulting, and I have an identity, that identity is disabled, please respect my identity by using the word I self identify with to refer to me’ and I also mean ‘I would vastly prefer that you consider not using it as a default/general term, but use it for self identification if you identify with it, and to describe other people who self identify with it.’ And, in return, if I know that someone identifies as special needs or with any other term involving ‘special,’ I will refer to that person that way, because I believe that respecting self identification is a critical thing. However, I note that I don’t personally know anyone who identifies with this term; I see it being used by nondisabled friends and family, applied as a label by others and not claimed as a self identification. The very idea that accommodations are ‘special’ stresses that they should not be expected. That they are a prize or treat. That you don’t deserve them. I want to see accommodations normalised. I want to see it assumed that everyone who wants to participate in something is able to do so, that no barriers are presented by other participants or the venue. I don’t want that to be ‘special.’ I want it to be ordinary. Likewise, the idea of referring to human beings as ‘special’ is one I find troubling, not least because this term has become weaponised. I have trouble parsing whether it is being used as a celebration of identity or an insult whenever I encounter it. The “special needs” language falls into normativity. There’s a “normal” and a “right” way to do things, and that way is how able people do it. If you don’t do it that way, suddenly it’s “special” because it’s different and scary. “Special needs” is part of this dichotomy which is used to split able and disabled. Indeed, to alienate disability. Disability is different and “special” and hard and weird. “Special” is an isolating word, in fact, because it sets people apart, and not necessarily in a good way, no matter what the original meaning of the word is. Think “special bus” or “special education,” both of which are used to isolate developmentally disabled folks from their peers, often under the argument that they are “hard to control” or “disruptive” or “upsetting” or, sometimes, just “gross.” People use “special” to push these folks away, to isolate them somewhere where they cannot bother the nice able people. It’s one of the many euphemisms for disability which is used to create a veil of obscurity. Disability as Other. Indeed, “special needs,” a term which people often use because they are fumbling for something else to use, looking for the “right” way to say it, is intensely othering. For one night, the special needs community will shine! And then the day after, they will go back to being ignored by much of their communities. Here’s the real problem for me – why put this money behind isolated, segregated, events? I know Tebow et al. think they are doing good here, and I’m sure the people who go will have a good time. But it accomplishes nothing other than a brief moment of fake normality. “Prom” didn’t matter to me, but to many people prom = normal highschool experience. So if people with disabilities are being excluded from such activities, if that’s something they want, then the solution is to put time and money behind making such events more inclusive and more accessible. A segregated special event for special needs, no matter how well intentions, just reinforces the idea that people with disabilities cannot function in “normal” society. We predicted and observed that persons of all ages are viewed more negatively when they are described as having special needs than when they are described as having a disability or having a certain disability. We concluded that special needs has become a dysphemism, similar to lame (e.g., a lame idea), crippled, blind (e.g., blind to evidence), and deaf (e.g., deaf to reason). Our research did not explore whether non-disabled people’s use of special needs is intentional (although some instances clearly imply negative intentionality). Perhaps, as Simi Linton suggests, non-disabled people’s ambivalence about disability rather than sharp repulsion underlies their use of the term special needs. 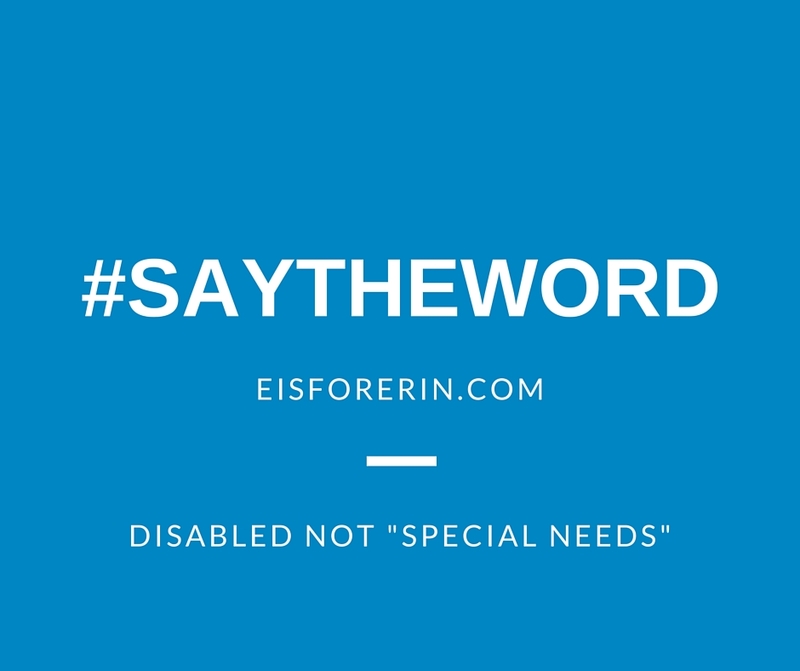 Regardless of speakers’ and writers’ motivation, our research recommends not using the euphemism special needsand instead using the non-euphemized term disability. They are not “special” needs. They are needs I have because of disability. Saying it differently doesn’t change the fact. Saying it differently actually perpetuates the stigma around disability, increases the likelihood people will continue to see me as other and broken, and decreases the chance my needs will be met. During these 12 years, many things have changed, my vocabulary too. I don’t use the word “normal” anymore, I use “typical”; I don’t use the word “special” anymore, I use “disabled”; I don’t use the word “gift” and I don’t consider my daughter as a superheroine; I’m not a “special mother” and my daughter is a girl with Down syndrome who lives her life with the same need to belong as everyone else. Euphemisms are not helpful so let’s call things by their name – disability #saythewordit’s what disability activists ask for. To tell it like it is allows me to look at things without hiding, to face life in a direct way. And it allows Emma to do the same. I feel as if I am respecting my daughter more, as if I am giving her the chance to define her own identity over time, of which disability is part. Disabled people should control the conversation about their disabilities, and the language used about them, not their parents. “Handi-capable”, “People of all abilities”, “Different abilities”, “Differently abled” and “special needs” were made up outside of the disabled community, by people without disabilities. Their continued use, and the defense of their use by people without disabilities reeks of able-splaining; that is, people without disabilities explaining disability to people withdisabilities. Then the word “disability” makes complete sense. Those of us living with a disability are absolutely living a dual existence: we move through the mainstream world which is largely inaccessible and not disabled, and we have our own experience with the fact of our bodies. We see, hear, speak, think, learn, process, read, write, move, and/or feel in ways that are less common than most. We have a lot to offer, by dint of our experience with disability and where our interests lie. Our needs are not special, so please: say the word, as we are asking you to. “Special needs” is a patronising euphemism. Special, by definition, means “better, greater or different from what is usual”. In reality, ‘special’ in the context of “Special Needs” is a disingenuous use of the word. What people seem to mean when they say ‘special needs’ is that people with impairments require more attention, they are more expensive to care for and are more difficult to provide for than those without impairments. So what is the result? A situation where people with impairments are excluded because they have “special needs” they are more difficult than those without “special needs”. However, in reality, we all share the same needs. Everybody requires water, food, shelter and love, in order to survive. In parts of Africa, we have seen disabled young people who have been isolated. They have had no food or drink and no love. These people are not special, their needs are the same as all of ours. Despite the fact that the vast majority of people (including me) use certain terms with the very best intentions, sometimes it is counter-productive. Merely labelling a group of people – disabled people – as “special” implies they are recognised as being far different from everybody else. The consequence of this is that they will be treated differently, ensuring that the stigma (which exists in all cultures to varying degrees) remains. This is the opposite of inclusion, despite the fact that inclusion is often the aim when using the term “special needs”. I believe that a reason why, as a society, we have not embraced children with disabilities as full participants in our schools and communities has to do with the limitations of our own mental models around disability. We have moved from hiding and institutionalizing kids to a world where children with disabilities are seen as special and placed in special settings and given special services with special caregivers and they, and their families, have become disenfranchised from the community at large and they have become in fact their own separate community. I believe that “special” has become a euphemism for “separate,” and when we separate kids and we place them in separate settings and give them separate services we are teaching them that their place is over there, with people like them and not as part of the full community, and when young, impressionable children learn that their needs are too great that they are too different and that they don’t meet our very narrow definition of what normal is, this has a life-long effect on their ability to contribute positively to society.